Fascia remember is the number one innervated tissue in the entire body. Since so much of the nervous system is embedded in the fascia it must have a great impact on all movement and coordination, both of which are nervous-system tasks. It is only when an individual moves with ultimate EFFICIENCY that peak performance is achieved. Strength and speed are secondary to fluid, co-ordinated, effortless movement that relies on healthy fascia. All sports including power lifting, running and bodybuilding benefit from movement patterns that are effortless and automatic, harboring no compensatory adjustments to position that ultimately reduce strength and endurance capacity. So make time in your health regime to address fascial quality. Here are the top two healthy fascia rules. NUMBER ONE FASCIAL RULE: Hydration. This is easy to dismiss but imperative for optimal performance. Fascia is water and glycosaminioglycans that essentially hold the water within the system. If the water is deficient the hydraulic fascial system the shunts water within the body can bind together adhering to whatever is under or through the fascial bed. IF nerves are within the dehydrated fascia then those nerves are subject to the effects of a dehydrated medium, which may present as uncoordinated movement or pain. When the brain senses pain it alters the path of intended movement leading to a less efficient performance pattern. Fascial hydration is your coordination. So how do you know if you are Hydrated? Take your socks off. Is there an indent where sock band hugged your calf that take more than 30 seconds to subside? That may indicate a level of dehydration that has led to pooling of fluid in the extremities because the wave of water pressure is not intense enough to move against gravity up the system. You need more water. Another good daily tool to test hydration is the thumb print. Press into the back of your own hand. How long does it take for the print to subside? The quicker your imprinted finger print disappears the better your hydration. Be careful not to drink so much clear water as to move into hyponatremia, a situation that has the electrolyte concentration flush out of the body as too much pure water comes in. Be sensible and maintain a healthy hydration for quality fascia. Stretch the fascia not the muscle. 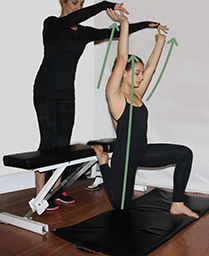 Fascial stretch requires different techniques than traditional muscle belly stretching. Fascial stretch requires that the ENTIRE body be engaged in the stretch connecting the body wide web toe tip to tongue. These stretches will create a flawless flow of movement. It is less about flexibility and more about body wide alignment. Fascial stretch positions are held for 30 seconds minimum to 90 seconds optimum. With total body engagement your body will have the opportunity during the stretch to correct alignment of any boney junction. The better aligned joints the greater the improvement to performance. Optimum alignment will create a body that is so efficient it doesn’t have to waste energy into compensatory corrections. Therefore you can access the strength you worked so hard to earn with little or no wasted energy. Here is example of quad stretching with fascial technique versus the typical muscle belly stretch. The green lines demonstrate the direction of tension upward with the torso. The foot also presses down into the prop. In the picture the spine is decompressed with the fascial stretch along with the hip joint. If the model were to tuck the pelvis under the top of the psoas would also stretch. Hold for 30-90 seconds with tension. Prop under the foot is proportional to the individual’s needs.